A polio-afflicted young man is turned into a superhero in World War II, but vanishes before almost anyone knows of him, only to turn up decades later in a block of ice. 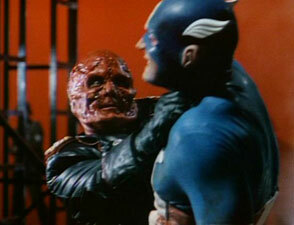 Now in our time, he grapples with waking up in a new and strange world, and has to take on his nemesis, the Red Skull. And here it is. The notorious 1990 version of Marvel Comics’ star-spangled hero has gotten a lot of grief over the years, though most people have never seen it. After failing to follow through on a planned theatrical release (except overseas, where it did a tiny amount of business), it did come out officially onto VHS in the USA around 1992, as well as laserdisc. Until now, it had not shown up on disc, except for pirated DVDs of course. It is tempting to pile insults on this movie further, but the truth is, it’s not nearly the worst Captain America adaptation out there. 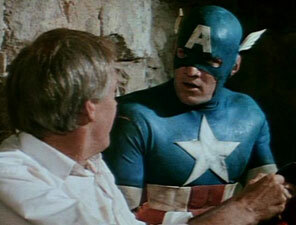 After all, the 1944 movie serial wasn’t even scripted to feature Cap. 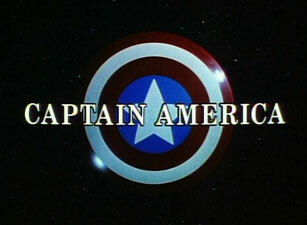 It was written for another comic book character before the producers lost those rights and substituted Captain America. 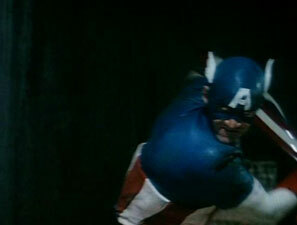 The costume was at least close, except for dropping the wings from the side of the mask and hiding Cap’s ears. The 1966 cartoon barely qualified as animation, using panels from the comics being manipulated in front of a camera, with stodgy voice acting re-enacting the comic book stories. The two 1970s telefilms made only a bare effort at bringing the character to the small screen, plopping a motorcycle helmet on him and giving him a whole other costume and background. The 2011 motion picture got a whole lot right and overall easily wins as the best adaptation, but even it was wishy-washy about presenting the costume from the comics, going with a more militaristic ensemble. It worked nicely, but it wasn’t the comic book Cap. So, I’ll just come out and say it. 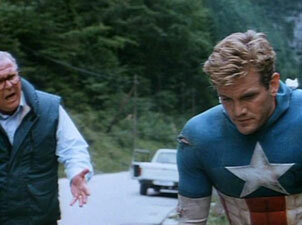 The 1990 film has the best live-action Captain America costume. Of course, one has to look past the, uh… rubber ears. Yes, rubber ears. The costume people couldn’t grasp how to make the ears look right if they were showing through the sides of the mask, so they went and made… rubber ears. And you can tell, too. They’re too shiny, and during the course of the film, they get beat up and misshapen. It’s a tragic flaw in the movie. But of course, that’s just the tip of the iceberg. The final editing is choppy, the score is notable only for being forgettable, and the stunts fail to convince. The visual effects aren’t too laughable, but they’re not impressive either. Some of this is understandable, given the production history. This movie was low budget to start with, and then lost all of its financing before finishing production. Production then rushed to a conclusion, without the director’s full vision being realized. Some might argue that could have been a good thing, because the movie does have trouble settling on a tone. At times it feels like a decent “B” action flick, but at other times the camp factor is quite evident. The story begins in Italy in the year 1936. The Nazis kidnap a boy prodigy from his parents, and plan to conduct a heinous experiment on him to turn him into a super soldier. Prior to the experiment commencing, an Italian lady scientist who is present, named Dr. Maria Vaselli, objects and flees. She manages to escape, but the boy is still transformed into a red-faced monster, later being named The Red Skull. Meanwhile, the United States is developing a similar program, and the Italian scientist manages to make it to the U.S., providing ample help to the American program. The Americans use a different tactic to gain their guinea pig. They ask for volunteers, and select the best candidate. That man is Steve Rogers, a civilian who could not join the army due to being crippled by polio. In 1943, Steve (played by Matt Salinger, son of author J.D. Salinger) says good-bye to his family and his girlfriend Bernice, and goes off to get experimented on. 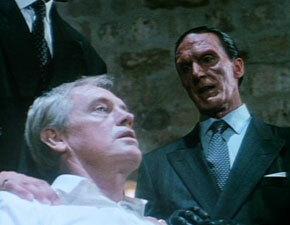 He meets the kindly Dr. Vaselli and is taken to a hidden underground base. Here, we meet a smarmy young officer named Fleming, played by Billy Mumy, all grown up from his Lost In Space days. The experiment proceeds and, despite showering way too many sparks all over the place, is successful. Steve gains strength and general physical prowess, and is no longer crippled. 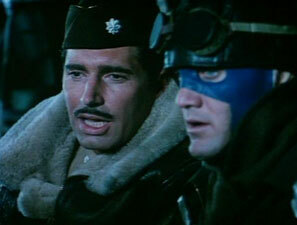 The scene quickly turns tragic, however, when a Nazi agent guns down Dr. Vaselli and also shoots Steve. Steve recovers in hospital, but Dr. Vaselli is dead. 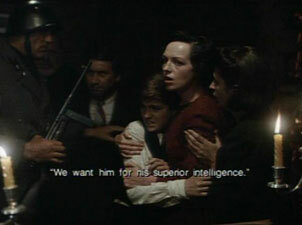 There will be no more super soldiers, as the doctor never kept written notes concerning the program’s greatest secrets. Steve has little time to recover, as Lt. Col. Louis (Michael Nouri) informs him that the Nazis are about to send a rocket to the USA that could kill countless people. 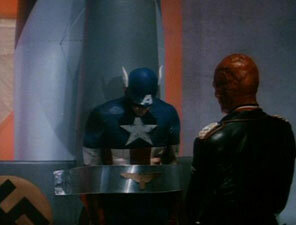 Steve is dressed up as Captain America and is flown to… somewhere (the movie doesn’t specify), and confronts the man behind the rocket project: The Red Skull (Scott Paulin, in what is actually quite effective makeup). The Red Skull immediately knows there is a link between the two of them, but Cap’s insistence on staying true to the ol’ red, white & blue serves to get him pummelled by the Red Skull. Steve gets strapped to the rocket, which is being aimed at the White House. Though a tight grip on the Red Skull has Cap managing to force the Red Skull into cutting off his own hand (which made little sense, as Skull could have presumably cut Cap instead), Cap is still sent off on the rocket. 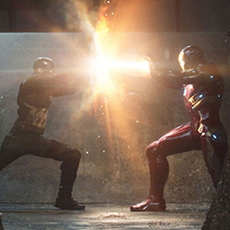 While in flight, Cap manages to damage the rocket, causing it to change its trajectory. It narrowly misses the White House, as a young boy snaps Cap’s photo (still strapped to the rocket), before the rocket veers off and heads to Alaska. So far, the story ain’t too bad. But then there’s the rest of the movie. The story speeds forward a few decades, as shown by a cheesy newspaper montage. The montage does serve, however, to show us that the little boy who took the photo grew up to be President. Amazing! 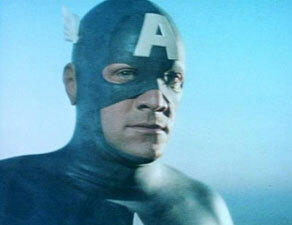 Meanwhile, Cap is still buried in the ice, but is finally discovered by an Alaskan survey team. They somehow manage to cut him out of the ice in one big rectangular block, then watch stunned as Cap breaks the ice and staggers off, out of their tent and into the wilderness. They stay stunned, too, with NONE of them offering to orient Cap and intervene in any way. Cap is left to wander hundreds of miles (moving from snow to no snow) into British Columbia, Canada (well, it could be the Yukon, but later events suggest otherwise). A photo taken by the surveyors winds up in the newspapers, which sets off a mighty chain of events. President Kimball (Ronny Cox) recognizes the man who saved the White House decades earlier, and he calls up his childhood buddy Sam (Ned Beatty), who is now a Pulitzer-winning reporter. 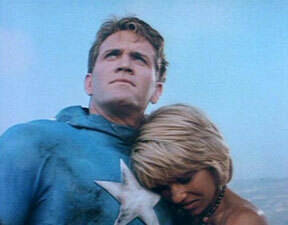 He sends Sam to find Captain America, though the military might have been a much, much better choice. The Red Skull, now a powerful industrialist with a near-normal face following plastic surgery (and no longer red, making his name nonsensical), also finds out that Cap is alive, and he sends his daughter and her femme fatale friends after him too. (Incidentally, Fleming is still around too, and is now a general played by Darren McGavin, and he is in league with the Skull.) Sam and the ladies both amazingly manage to find Cap in the wilderness at the exact same time, and Sam manages to rescue Cap from the deadly women. Cap then fakes carsickness to fool Sam into exiting the vehicle so that Cap can steal Sam’s truck (because he suspects Sam is a Nazi agent). Once he runs out of gas, Steve has to bum rides off unsuspecting truckers, eventually arriving in his home state of California. He looks for his old girlfriend, and mistakes her daughter Sharon (Kim Gillingham, in a dual role) for being her. Sharon beats up Cap, before Bernie comes out to intervene. He is shocked to find Bernie looking old, and Steve knows that it’s true… he really is living in the 1990s. After spending time with Bernie’s family, Sam shows up, and then the Red Skull’s agents invade the house and cause plenty o’ trouble. Steve misses it all, though, because by now he’s hanging out with Sharon at her pad. Yep, makin’ time with the girlfriend’s daughter. Nevertheless, the events at Bernie’s house lead Steve to hunting for the no-longer red Skull, and he and Sharon head to Italy, where Steve must confront his “brother.” Of course, he dumps Sharon there, after using the ol’ carsickness routine again! But Sharon is resourceful, and ends up being essential to Steve’s mission of capturing the Red Skull, not to mention rescuing the President, who is kidnapped while attending a conference in Italy. So, already you should be able to see some of the script’s problems. First of all, Cap is no “living legend” in this film. His one mission in WWII was a secret, and he largely botched it, even if he did save the White House. After waking up decades later, he gets beat up by some women, steals a truck (by faking being sick), gets beat up by his girlfriend’s daughter, gets a few people killed, and steals a second vehicle after once again feigning illness. Oh, actually there was a stolen motorcycle, too. That makes three vehicles altogether then. He also ends up being saved BY the President at one point, and though he defeats the Skull in the end, he achieves it through… the power of music. It’s a cheesy finish to a cheesy film. I appreciate my heroes being human, but it would be nice to see them looking heroic some of the time. Salinger does fine in the role, but the script only sets Cap up as a doubtful schmuck who only seems to screw everything up and act decidedly un-heroic. 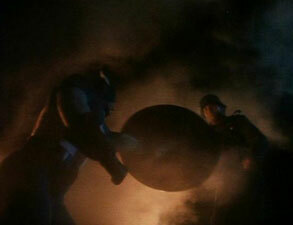 On the other hand, he does throw his shield a lot, so that’s something for the comic book fans to cling to. And there is action, though it all feels much more like a TV show than a major motion picture. I have now watched this film three times in my life. The first time (VHS), it felt like a disappointing mess. The second time (laserdisc), I was bored. This time, watching the new DVD, I did some judicious fast-forwarding, and found that the 97-minute film made for a semi-decent one hour’s worth of light entertainment. If you go in with the right expectations, and your remote handy, it is possible to find something worthwhile to spend your time on. Remember, the movie works best as camp. In case you forget that while admiring the reasonably nice costume, just look for those rubber ears. The fairly uninteresting menu reveals this disc’s single bonus feature: the movie’s original Trailer(1:49), prepared when the producers actually still thought this movie was going to be released. It’s not a bad trailer, really, given what they had to work with. The film, as shown in the menu shot, gets chapter stops every ten minutes. This disc is offered only online, through various retail partners, as part of a manufacture-on-demand program. This means that the disc is actually a burned DVD-R, and no-frills. The menu is barely modified from the generic menu look of MGM MOD discs. The fanciest looking part of the disc itself is the FBI warning printed on it. The front cover of the standard keepcase is nice enough, if somewhat generic-looking. The spine uses a design and font that says, “home-made.” The back cover looks like public domain blandness, though there is at least a photo with Matt Salinger and Kim Gillingham. The credit roll takes up half the back cover, as if they couldn’t think of much to say otherwise. The front cover proclaims the movie to be the “Re-Released 1992 Edition” as if that’s supposed to mean something. As far as I can determine, this is the original meant-for-theatrical cut from 1990, though it likely only came onto VHS in the U.S. in 1992. Note that a longer cut is out there, distributed probably not exactly legally by director Albert Pyun himself, from a workprint he had in his possession. The presentation is disappointingly in the 4:3 ratio. I had hoped to finally see this in widescreen as my earlier laserdisc of the movie was also only in 4:3. I did try zooming the picture to fill my widescreen set, but while it worked for some shots reasonably well, overall the framing was just too tight to zoom it for the whole movie, so this appears to be a pan & scan job. As for the picture quality, it’s best not to ask. However, I suppose I shall have to comment. When the movie opens with a disclaimer/apology about the “best source material available,” you know you’re in trouble. This looks about on par with my laserdisc— relatively low-resolution, too dark, a little grainy, and with details totally lost in any fields of black. The good news is that colors are richer and more solid looking on the DVD. Dust is frequent, though, as is aliasing. Some scenes get quite speckled. This is a poor, dirty print, with no attempts made to clean it up. 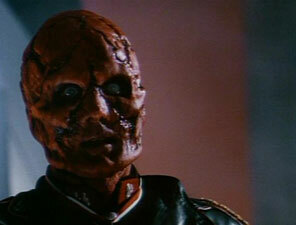 On the other hand, it’s quite watchable for anyone who remembers what it was like in the VHS days. It’s just not really DVD quality. As a manufacture-on-demand title, working with elements made for VHS, one shouldn’t be too surprised. The 2.0 soundtracks varies in intensity and fidelity, but basically does the job… if you can excuse some synching problems that crop up from time to time. Truthfully, though, I was surprised at the strength of bass, which gives decent support to various bangs and explosions. Naturally, there are no other audio options for this MOD disc, and no subtitles. 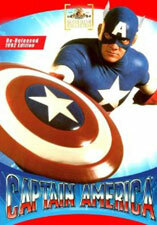 The 1990 Captain America is what it is: a troubled production with a wonky script, an actor new to a lead role, and an agenda that was more about deconstructing a superhero rather than presenting a heroic ideal. It also has all the best parts in the first half hour. There is an interesting effort somewhere in this movie, though the result is something no one really wanted to see. As a curiosity, though, it is a near essential movie for the superhero buff. Weak video and audio hamper any recommendation, but anyone truly interested in seeing this shall just have to be forgiving.